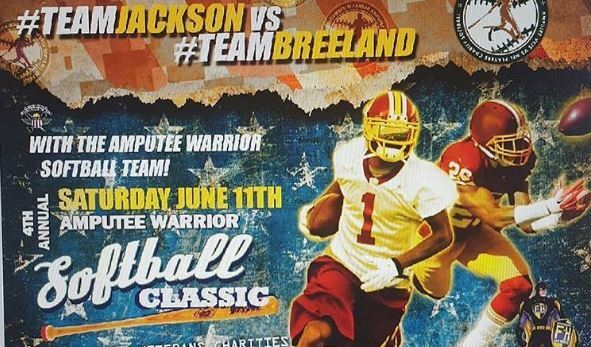 Please join DeSean Jackson, of the Washington Redskins, and his friends from the NFL for their 4th Annual Celebrity Softball Game, in Bowie, MD, on Saturday, June 11, 2016. The purpose of the annual event is to raise awareness and funds for prosthetics and orthotics for our nation’s heroes as elite NFL players compete against the Amputee Warrior Softball Team. Where: Prince George’s Stadium, Crain Highway, Bowie, MD, Gates Open: 6:00 P.M. The Wounded Warrior Amputee Softball Team represents some of our nation’s bravest and most determined heroes, soldiers and veterans. These men have sustained severe injuries resulting in amputation, and through extensive rehabilitation, they have become competitive athletes again, playing against able-bodied teams in exhibition games across the country. Their armor now includes prosthetic legs and arms, along with extreme perseverance and attitude. Together they are the WOUNDED WARRIOR AMPUTEE SOFTBALL TEAM. © Copyright 2015 Wounded Warrior Amputee Softball Team. “Wounded Warrior Amputee Softball Team”, the “shield” logo, and “WWAST” are trademarks of Wounded Warrior Amputee Softball Team, Inc. Any use without authorization is strictly prohibited.